Market Correction - What Does It Mean? What is a market correction? What is the definition of a market correction? A market correction is not to be confused with a bear market. A bear market is a long-term downtrend in the market that is dotted by occasional surges higher. A bear market is not a correction. 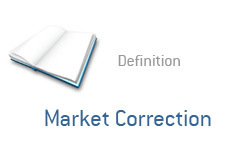 "Corrections" take place in the midst of a bull market, which is defined as being a long-term uptrend in the market. There is no hard and fast definition of the term "market correction", but most will agree that it usually a 15-20% (max) drop in the markets in the midst of an overall uptrend. Hypothetical Example: The NASDAQ is in the midst of a long 4-year bull market run. There is some sort of a geopolitical event (say, the economic collapse of a sovereign nation) and the markets tumble 17% on the news over the course of two weeks. Worries also flare up that the market might be overbought and overextended. However, the markets soon regain their confidence, reverse course and begin to head higher once again. This would qualify as a "correction" - a sharp downturn in the midst of an overall bull market. Is Another Major Market Crash on the Way?